Apple's surprise $1 billion investment in Chinese ridesharing service Didi Chuxing was forged in just 22 days, and the two companies are now in talks in several fields, a report said on Friday. The ball began rolling during a meeting with Apple CEO Tim Cook on Apr. 20 at his company's Cupertino headquarters, Didi president Jean Liu told Bloomberg. A separate source told the site that Liu didn't intend to ask for capital at the meeting, but was instead looking to discuss the Chinese market and possibilities for cooperation. In the wake of Apple's investment, the two firms are now in talks on cooperation in sectors including products, marketing, and technology, according to Liu. "It feels very natural to work with Apple together because philosophically on a company level we share a lot in common," she said. Other Bloomberg sources indicated that Apple's $1 billion influx brings the total in Didi's current round of funding to $3 billion. The company is seeking a valuation of $26 billion, which would make it the world's fourth-most valuable startup. Apple's exact interest in Didi Chuxing —beyond a direct return on investment —is uncertain. Cook said that the deal was made "for a number of strategic reasons," among them "a chance to learn more about certain segments of the China market." Apple is believed to be working on an electric car for launch in 2019 or 2020. That model, or more likely a later one, could be self-driving. 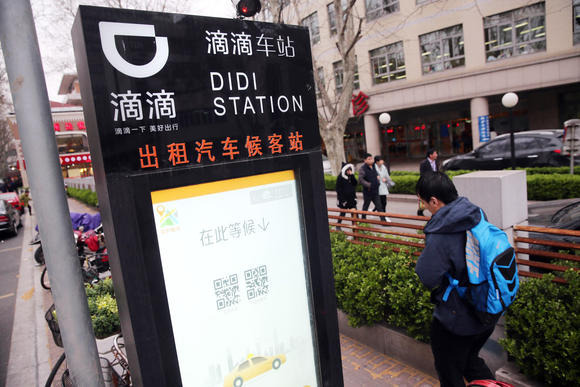 A deal with Didi may be connected, whether Apple is simply looking to glean information, or angling at having its vehicles in Didi's fleet. Rival ridesharing service Uber has regularly expressed interest in switching to self-driving vehicles.